The banjo barometer is also known as the wheel barometer. It was invented by Robert Hooke in 1663. The National Museum of American History houses an example of this rare antique banjo barometer. The invention of antique barometers prompted Hooke to write to Boyle expressing confidence in his invention. He notes that the barometer may forecast and forewarns on the weather thereby preventing many dangers, and the good of mankind thereby promoted. In the letter, he notes that he states that he founds most certain in predicting rainy and cloudy weather when it falls low, and clear weather when it rises high. Furthermore, unlike its predecessor the Torricellian tube, the banjo is a siphon barometer in which the tube takes is in the form of a U. 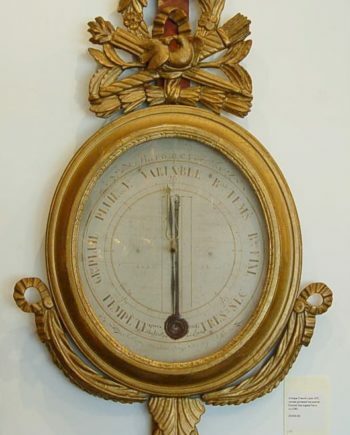 If the two mercury surfaces are equal in the area in such a barometer, a given change in height of the mercury column will be divided equally between the two ends, so that the movement of either surface will be about half as much of the mercury in the Torricellian tube. To magnify the motion of the mercury, the barometer has a large bulb on the upper surface hence concentrating motion in the lower exposed arm. A float resting on the exposed mercury surface in the open arm and a line from it passed over the pulley and ended in a counterweight. The pointer on the shaft of the pulley moves over a scale greatly magnifying the mercury motion and consequently better readouts. Early manufacturers of banjo barometers include; D. Faggioli and Son and Warner St Clerkenwell Workshops. The Taylor Instrument companies also produced some of them as noted by a donation they made to the Smithsonian Institute in 1923. The instrument is today considered an antique and vintage. Budds Huntingdon version is popular for their mahogany casing. The antique version of the device comes in pediment and pendant shapes of the traditional British style. They feature a range of exquisite wood finishes. Others English banjos are notable for their Gothic and broad Roman serif script indication on the dial. Though vintage, the classic instruments have found use at homes and public exhibitions. 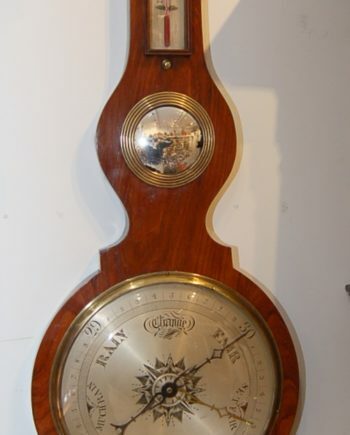 We have many antique banjo barometers for sale. If we don’t have what you are looking for, please let us know and we will source it for you until we get it for you. From our shop in Australia we also ship internationally to any country, such as the UK, Ireland, and the USA.